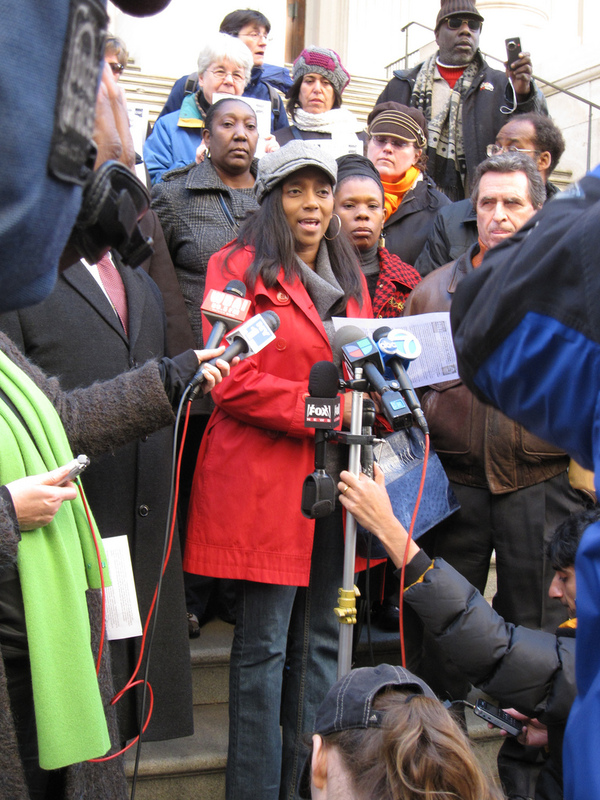 TV Coverage of Nov. 28 news conference. Coming to a school near you: Higher Class Sizes and Teacher Excessing: Are You Next??? 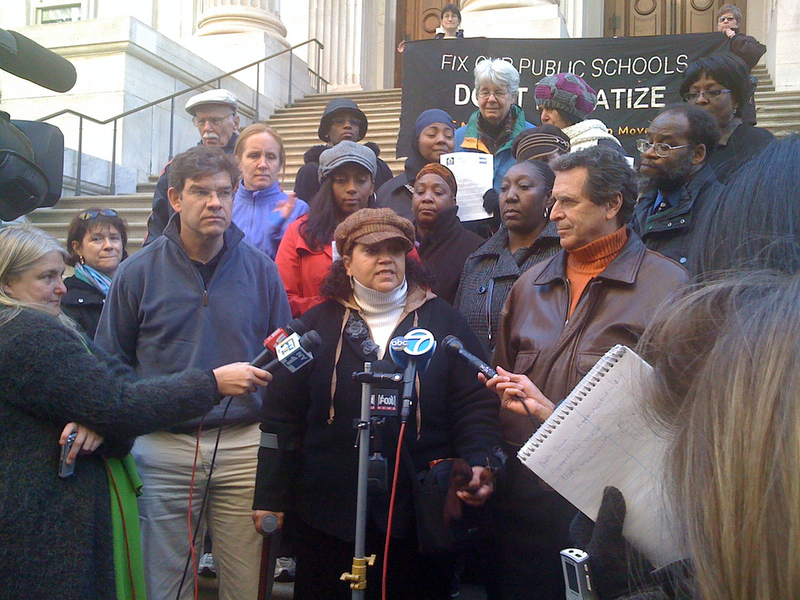 NYC public schools are already criminally underfunded and school-based budgets have been cut by over $400 Million since 2008! Tuesday, December 14, 5:30 p.m.
After serving the community for over 100 years, our space and programs are being threatened. Eva Moskowitz wants a new private HSA Charter School to co-locate in the PS/MS 165/Mott Hall 2 Campus and over time phase out these three outstanding public schools.P.S./M.S. 165 is renowned for its model Dual Language program, Gifted and Talented Program, and programs for students with special needs. It has a long history of community enrichment. It is not a failing school. Yet, a charter school without this long history of success wants to deprive P.S./M.S. 165 and Mott Hall II of space and resources in order to implement their own programming.” The school’s community rapidly mobilized and loudly opposed the Moskowitz Charter at their Community Education Council – CEC3. NOTE: The PS 165 fightback against Harlem Success seems to have been working and Moskowitz is shifting towards recruiting white middle and upper class students by aiming for space in Brandeis HS, which is closing down. Bill Gates has some advice to state superintendents on how to deal with their budget crises. Don’t reward teachers for Master’s Degrees. Those don’t matter, nor does seniority. Bill Gates “also urges an end to efforts to reduce class sizes” and “You can’t fund reforms without money. And there is no money.” I guess that’s where his own foundation’s $30 billion (with another $30 billion on the way from Warren Buffet) comes in…..
From the Wall Street Journal editorial of October 5, 2010. The odd complaint is that donors to charter schools include some hedge fund managers. Or maybe not so odd. Teachers unions and the public school monopoly have long benefitted from wielding a moral trump card. They claimed to care for children, and caring was defined solely by how much taxpayers spent on schools. That moral claim is being turned on its head as more Americans come to understand that teachers unions and the public bureaucracy are the main obstacles to reform. Movies such as “Waiting for ‘Superman'” and “The Lottery” are exposing this to the larger American public, leaving the monopolists to the hapless recourse of suggesting that reformers are merely the tools of hedge fund philanthropists. We saw a trailer for this anti-“Superman” film, which denounces most of the leading advocates for charter schools. The irony is that most of those criticized are Democrats or noted liberals who’ve been mugged by public school reality. « Join Us For Our Next Meeting on December 7th! Check the match for your shoes and dress under that light.